I’ve got a confession to make: here at Cobloom, we’ve been inadvertently contributing to the lack of gender diversity in expert roundup posts. Have you ever noticed just how many of the expert roundup posts you read feature men – and only men? If you haven’t, that’s fine – nor had I, until we were putting together our own expert roundup post last month, and not a single woman that we contacted got back to us with a quote. The end result? The post features expert insights from 17 awesome contributors, but only one of them is a woman: me. I hadn’t planned to contribute because Will and Ryan had both already decided to, but once I realised we weren’t featuring any women otherwise, I changed my mind. I thought the lack of female contributors was pretty strange; I know there's a huge gender gap when it comes to women in tech, so maybe this meant we'd only contacted men? I dug into the numbers for this post: we contacted 31 people, and 14 got back to us – a 45% response rate. But if we break that down by gender, the results get really interesting. We contacted 24 men and 7 women, which gives us a 77/23% split. Not a great start in terms of gender equality, but roughly in line with industry gender split statistics. What's even more striking is the response rate: more than half of the men we contacted (58%) got back to us with a quote, compared with 0 women. We’re seeing a similar trend for a post we’re working on at the minute for one of our clients: we contacted 27 people and 10 have replied so far, but not a single one is a woman. I’ve only contributed to two expert roundup posts to date: one of our own, and the other over at Chargify (thanks for having me!) – who, by the way, are doing much better than us with the gender split in their recent expert posts. Do my [male] colleagues here at Cobloom feel the same way? Yes, probably. But they seem to be better at focusing on providing their quote, rather than their doubts. 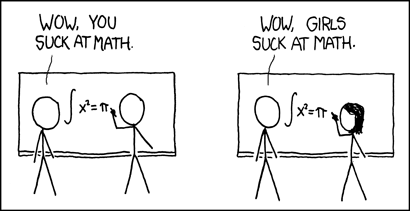 Perhaps it's a representation thing: they're never going to be 'the only' man in a roundup post, so their ideas won't be conflated as representative of 'all men' (see XKCD's excellent 'How It Works' comic which explains this much better than I can). Or they may just be more confident than I am, having contributed to more posts or having more obviously authoritative credentials. This leads to them missing the deadline and not contributing, while other people make it more of a priority, and as such get featured, get their name out there more often, and become seen as more and more of an expert on XYZ. Think Patrick Campbell with Price Intelligently, or Lincoln Murphy with Sixteen Ventures. These guys are experts in their field – partly because they dedicate so much time working and learning about it, but also because they share their expertise, publicly and frequently. They make ‘being seen as an expert’ a priority. It’s obvious: we contact an even 50/50 split of men and women, and then we feature an even 50/50 gender split of people in our expert roundup post. Except it’s not that simple, is it? Statistically, there are fewer women than men in SaaS - nowhere near the 50/50 split we'd like. So aiming for a 50/50 split of contacts would mean reaching out to fewer (awesome, knowledgeable, insightful) men to redress the balance. Not ideal. And while we can control who we reach out to, we can’t control who replies to us. But we have realised that it’s super important for us to consciously reach out to a greater number of women SaaS founders and experts when putting together these expert roundup posts. And for me, I’ve realised that if I’m asked to contribute to any guest posts, I should ignore my self-doubt and just go for it! If you’re reading this and you are a super-awesome lady who has opinions on SaaS-related topics, say hi to me on Twitter or connect with me on LinkedIn, and I can keep you in mind for future roundup posts. If you’re a super-awesome guy who works with ladies who have opinions on SaaS-related topics, maybe you could pass this on. And if you’re a person who spends time putting together expert roundup posts on SaaS-related topics… try and reach out to a few more women for your next post, please? Let me know: what’s your experience either as the editor of an expert roundup post, or as a contributor?